The temperature controls of B type flow Casting Film Production Line adopts advanced automatic control system and the T mold adopts the multi- spots adjustment. They could cause the film thickness to be evener. The cooling system adopts the circulating water cool and it cooling effect is good. 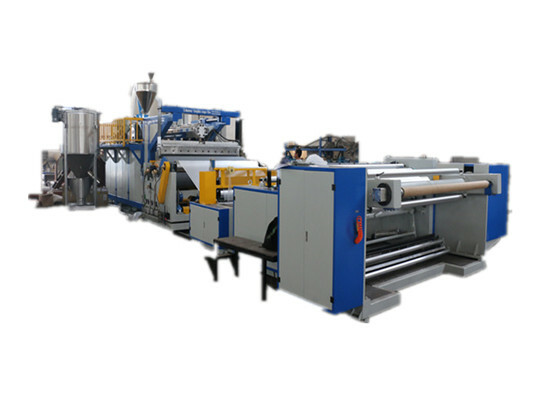 The rollout installment adopts the friction type of rollout and has the cutting edge installment and side material rollout element by round-trip, which causes the film which rollout to be neater. Our technical team has rich experience and strong executive ability, and the equipments developed by the technical team are with table and reliable quality, excellent index and high flexibility, have been obtained wide recognition and high praise from the users. The machine can produce various kinds of table cloths, plastic gloves, shower caps, suit covers, umbrella base film, and can also be used for producing sanitary napkin PE base film, diaper film, perforated base film, various types of packaging film, and deep-embossed film. When extra unwinding device is added, this machine can be used as Lamination Machine. If you have any question about the B type flow casting film production line, please contact us directly. We will reply you as soon as possible. We are willing to take you to visit the factory. Looking for ideal B-type Cast Film Line Manufacturer & supplier ? We have a wide selection at great prices to help you get creative. All the B-type Flow Casting Film Machine are quality guaranteed. We are China Origin Factory of Cast Film Machine. If you have any question, please feel free to contact us.